There is a common saying that the eyes are the window to the soul. If that is true, then the Flower feeding March fly must have one of the most beautiful souls around. 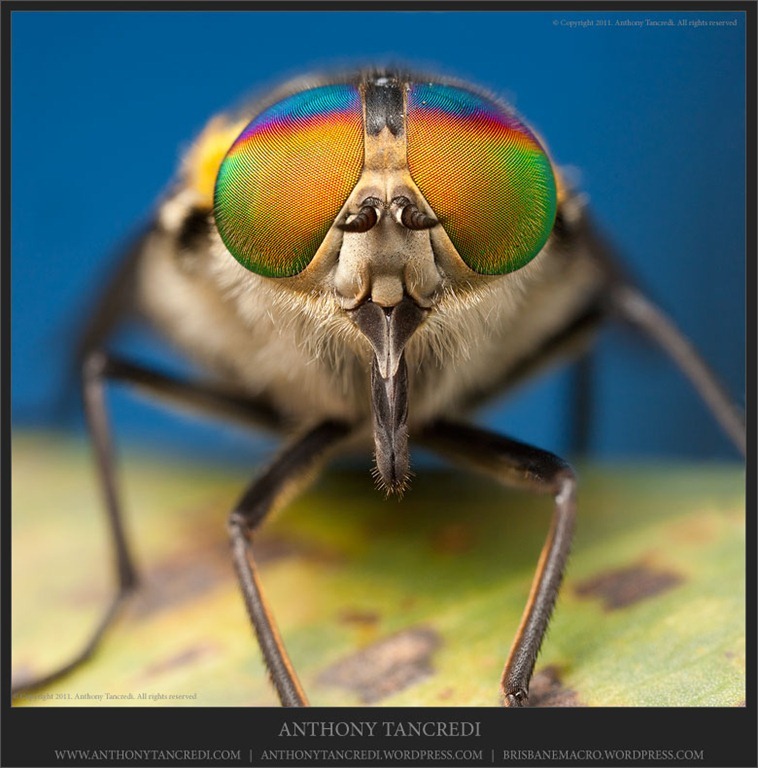 The faceted eyes of most insects certainly have something captivating about them… I’m sure most macro shooters will remember the first time they really captured the true detail of these structures. When the eyes come with their own built in psychedelic light show it’s time to suit up and make sure you get the shot! 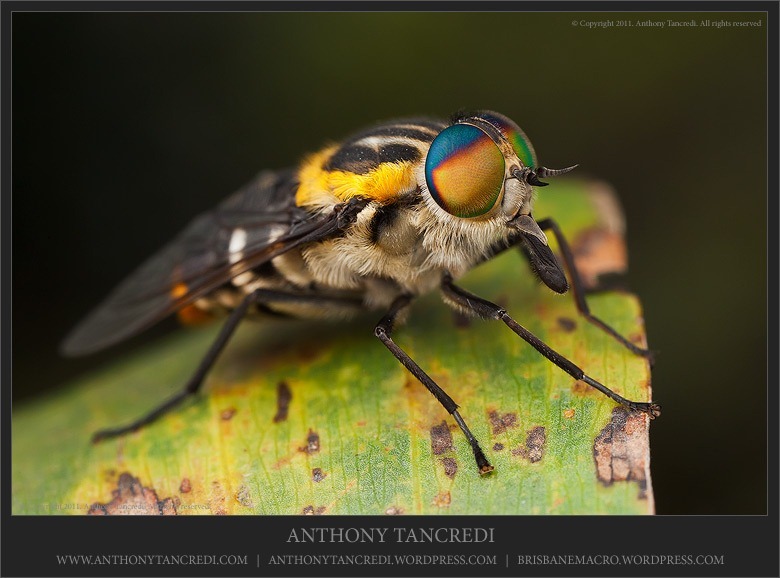 It’s not uncommon for these faceted type of eyes to show lovely colours when photographed using flash. I can honestly say however that I have never come across another subject where the colour is so vivid to the naked eye, even sitting in shade without direct sunlight. 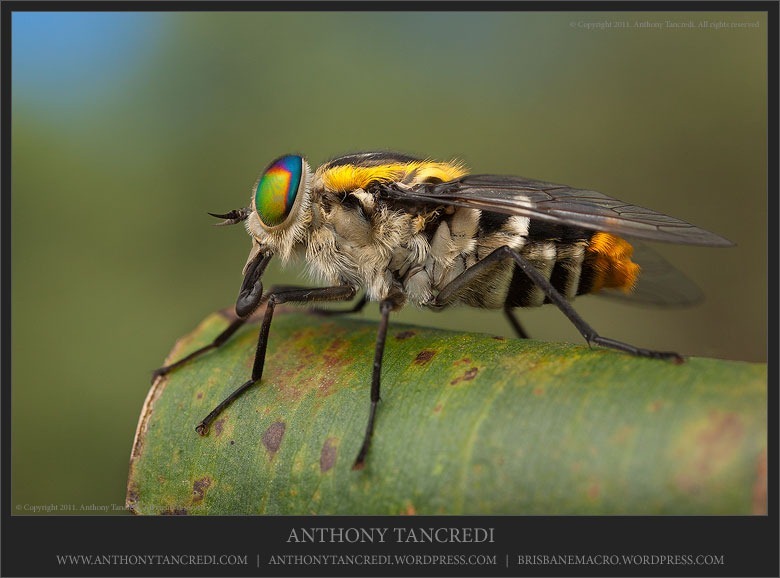 The flower feeding march fly (Scaptia auriflua) is a species that I have only come across once before. On that occasion, the subject got the better of me and was off in a flurry before I even got the camera to my eye as I had stumbled upon the subject and really had no chance. This time I was lucky enough to catch a glimpse of dazzling colour amongst the leaves and had the time and patience to approach in the right manner. Fortunately, this lovely lady was happy to sit still while I grabbed the shots. 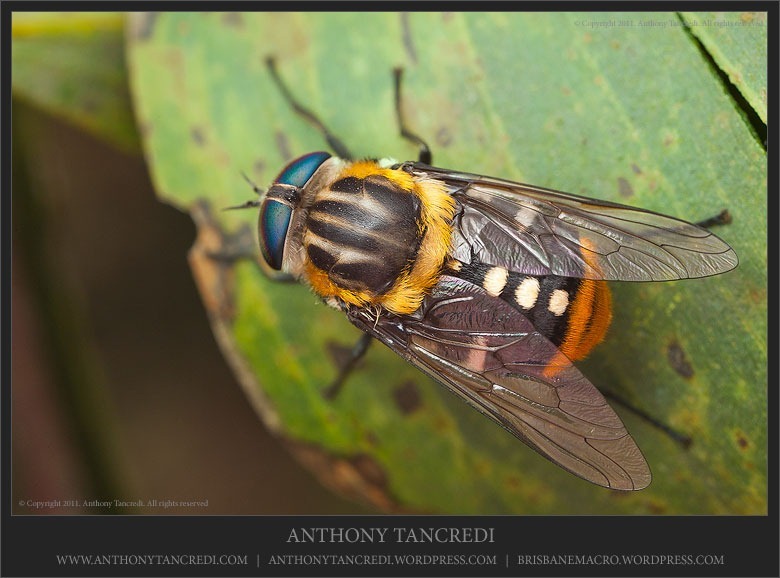 On a scale of 1 to 10, march flies (also known as horseflies) tend to be at the lower end of the scale in terms of likeability for me. They don’t hesitate to latch on and bite and often draw blood thanks to their large size. 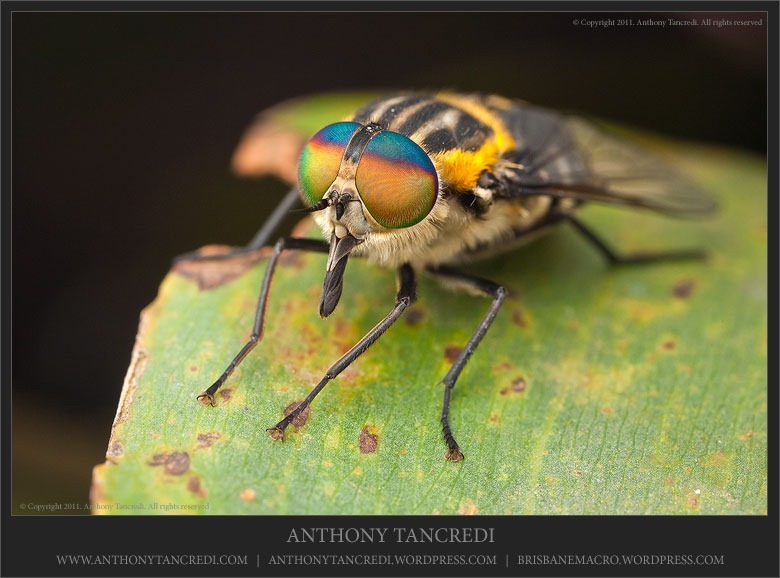 This species however is doing it’s part to restore the love… They feed exclusively on flowers, drinking nectar instead of blood, and with the incredible eyes and yellow body colouration, they are easy to appreciate! What’s green and yellow and purple? Answer: One of the best looking orb web spiders I’ve come across yet! Have you ever had one of those moments when you’re scanning the leaves of a tree or bush and a flash of colour catches your eye? Then comes that brief instant of excitement as you quickly look back to see what has tugged on the edges of your vision. All too often this sequence seems to end with either an ugly splotch of nothing on a leaf or one of the very common residents of my area (such as plain brown acacia beetles… argh, they’re everywhere! ). But just occasionally, when you glance back, you realise that you are seeing something for the very first time. The typical orb webs spiders I am use to seeing are large and shaggy, dark in colouration and all legs. 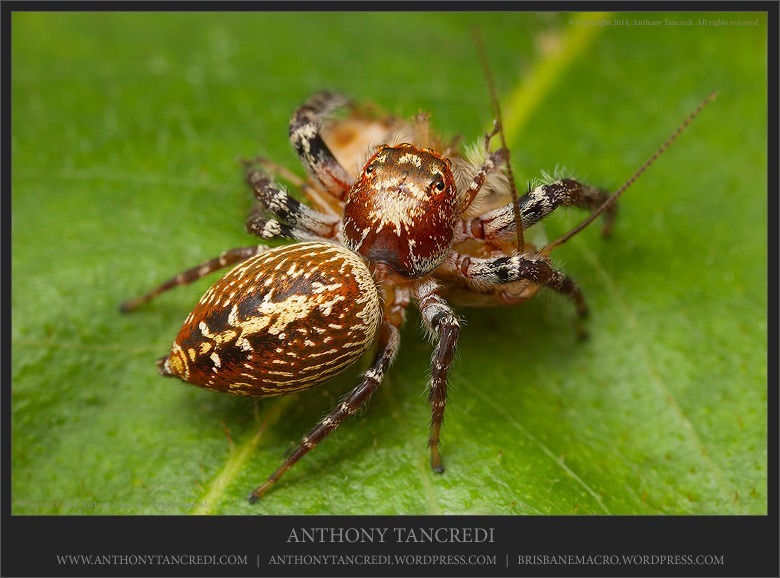 So when I spotted this small Araneus circulissparsus, I was very happy firstly to see a new species, but also just to see something different. 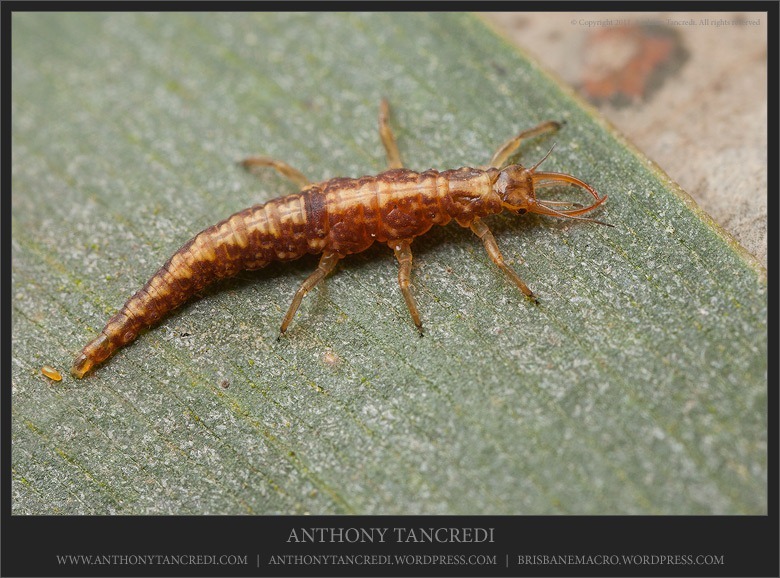 The fact that this small specimen is also a little stunner (in my very subjective opinion) is an added treat! 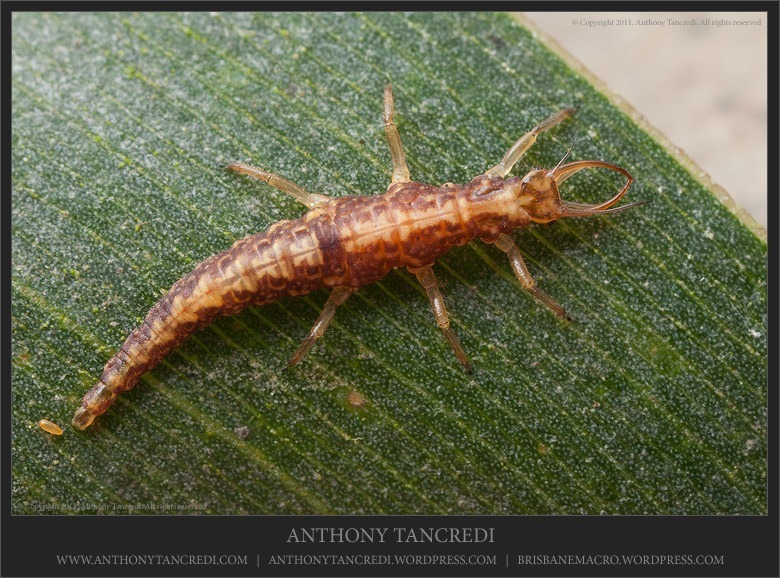 Small is actually quite an apt description of this species. At approximately 4mm from head to tail, it would have been all too easy to miss this one completely, and I may have done just that if it wasn’t for the beautiful colouration on the body. Luckily thought, that initial glimmer of colour was enough to register and send me looking more closely. It certainly helps to prove the point that vigilance is one of your best tools when looking for subjects! 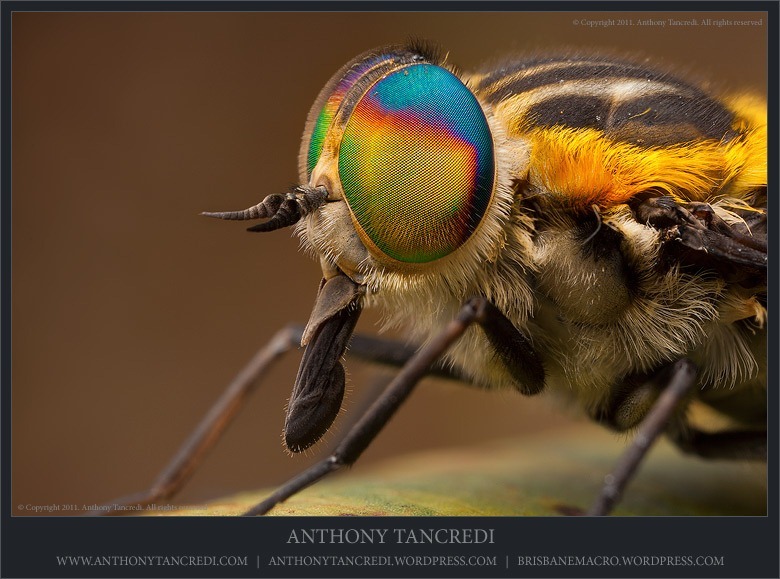 Regardless of whether spiders are something you love or something you hate, I would hope that most people would find at least something intriguing about them if they were to view them with an open mind. 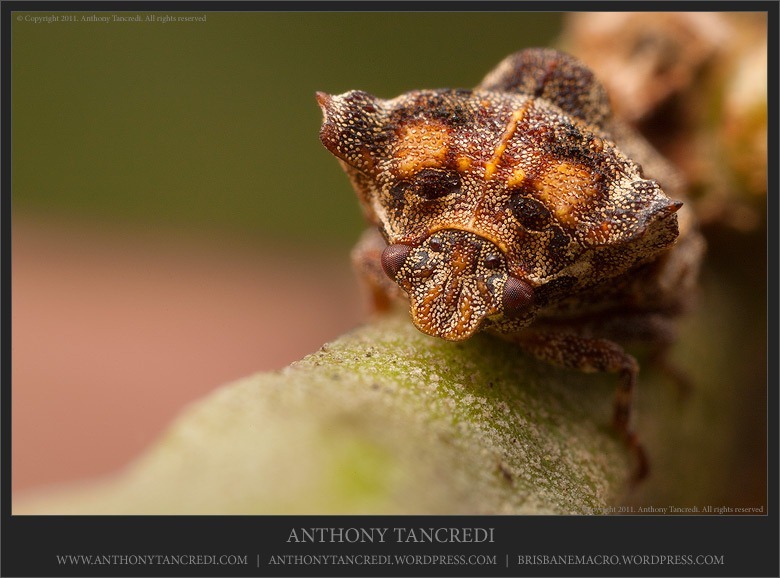 When it comes to hiding and hunting, the Thomisidae family are right up there for me. 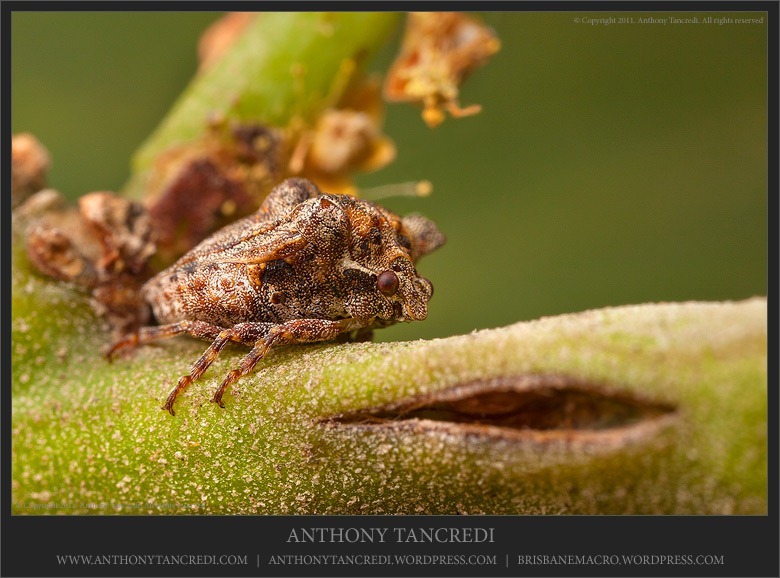 While I usually only come across a few species in my shooting areas, they always amaze me with their camouflage and hunting techniques. 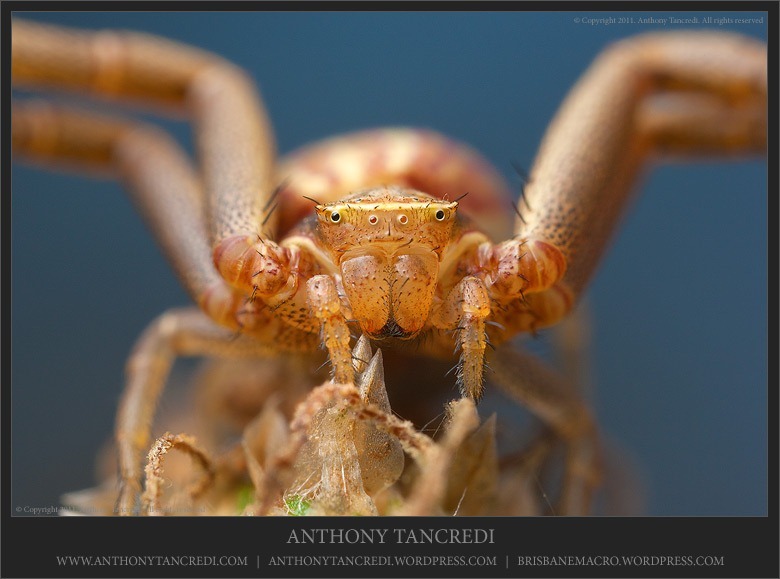 Recently, I was lucky enough to run across one of the less common species in my area… Runcinia acuminata or Long crab spider. The long crab spider is classed as common but this is only the second time I have found this species in the last two years and the first time in my new shooting area. Sitting hidden amidst a grass seed head, this particular spider was holding the trademark long front legs in the customary outstretched position. The reach that can be obtained by the front legs of this species is quite amazing, with the front leg length being over twice the entire body length. 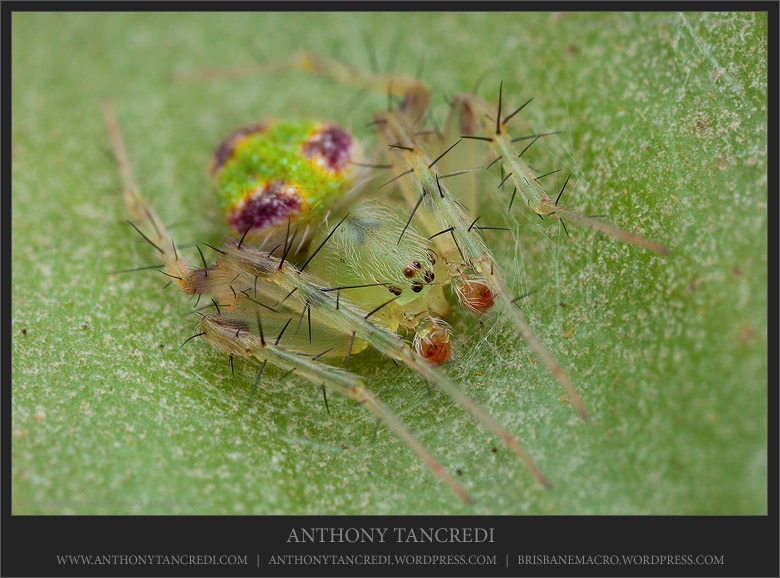 Given that this species is already called the “Long” crab spider, that’s really saying something! 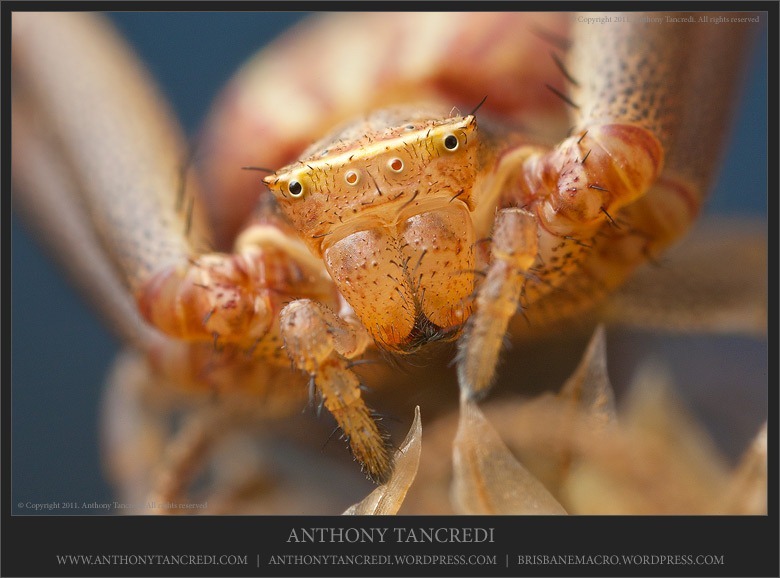 One of the things I love most about crab spiders is the broad, flat facial shape which lends something of a fierce look to them in my opinion. 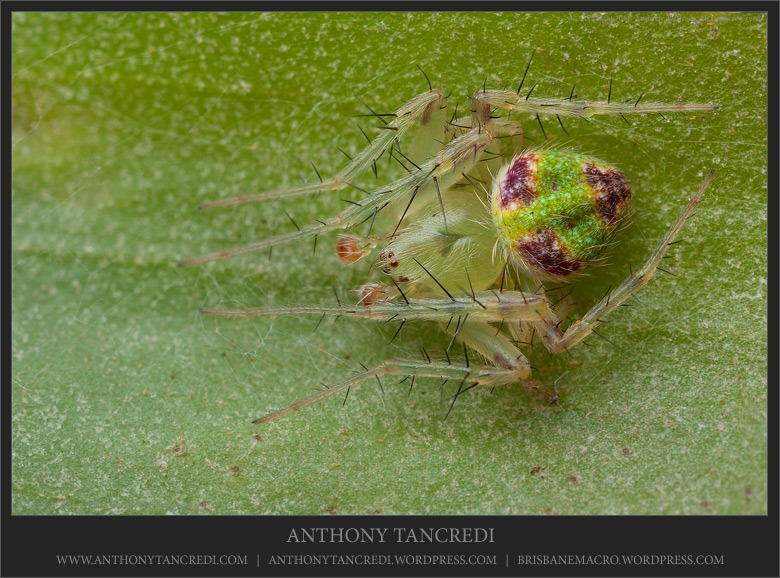 While they may be master ambush hunters, shooting this species, as with most crab spiders, tends to be enjoyable as they usually sit still in their impressive defensive pose. All in all, I was very pleased to come across this little fella and grab a few decent shots. It’s also nice to know they are roaming around my new shooting area as it will hopefully lead to a few more encounters! You are currently browsing the Outing category at Brisbane Macro.